Sean. kudo''s on thinkin of the kids. you are absolutely right about ''racing could change a kids life (it did mine I know). And let me know what becomes of sponsoring some kids to go to the race. You can contact me thru my personal email for that. I did not make it to the Isle, but heard and seen on TV vast improvements to the grounds. Thank you Mr. Penske! I have to be honest, I like my racin'' with fenders on the cars, BUT racing is racing, and if it will interest kids and change there goals or cerate an interest in that area, then I am all about it! Thanks for the detailed report Sean for those of us who did not make it there. First, what an awesome race. Go Danica 2nd place, after getting rearended into the wall. GO AGR, Sorry Roger, and thank you for all your efforts. Now, I Went to free Prix Friday at Belle Isle, but for some of the reasons bellow stayed home this weekend. It was a wonderful day. The facility was first class as far as actual construction, but managed to retain an atmosphere instantly recognizable to the small time sports car fan. Plenty of volunteers on hand, approachable corner workers, and just an atmosphere of welcomeness I didn''t think I would see, having been to the upity shmupity cart and F1 races there and downtown. A permanent concrete Grand Stand needs to be erected in the style of what they have at Dixie with concessions underneath, at the start finish line, but which fits the architecture of the island. Throw back style if you will. The banner hanging needs to be changed. I know it was for TV, but try putting the sponsors right on the walls where the banners interfere with attendees vision. Even from the high priced stands, what you could see was very limited, that is not good if you are trying to attract first time fans. One 6 year old next to me said repeatedly to his dad, Dad this is boring. That should be all Roger, god bless him, needs to hear. I know sponsors are super important here but the sight lines could have been opened up a great deal. Pull back the retaining walls so fans that pay general admission can see better, widen the track. Build up burms behind the walls for fans to stand on in places and use gravel traps in place of concrete to slow crashing cars. There were three small grandstands that lined the north east end of the track after the first series of turns but they were not adequate for good viewing. One good grandstand with a large video screen was erected at the slowest corner. Huh. Find away to build a massive grandstand north of the first series of turns so fans can see them and the twisting straight headed from the slow right left jog leading to the short shoot over the small bridge and into the right hander onto the back straight. And find a way to but grandstands along that straight, That''s where all the speed is. People need to see the speed or forget it. That''s what grabs the novice. That sounds like a no-brainer. Ultimately the very poor sight lines were what kept my money in my pocket and me on my couch. Finally, find a way to get discount admission to the poor folks in the neighborhoods around the island that border the race. If I was too poor to go see something in my own hood this big I would be pretty salty, and it truly demonstrates the inequity in our society. Sports are supposed to erase that. Make it inclusive. My favorite thing is seeing some inner city kid see a race car for the first time. Maybe cause I remember being that kid. Racing can change a kids life for the better and open up his or her eyes to places and cultures and ways of thinking they never dreamed about. Perhaps next year a bunch of us could find a way to sponsor some kids to go. This location needs to be changed from closed to openThe Grand Prix is sept 2nd weekend and features not only the corn fueled Indy Cars but also the American Le Mans series which are everything from road going cars to the most advanced prototypes in the world, ie 250 mile per hour diesel powered audis and porches. Belle Isle roars again. It looks like the 2007 Detroit Grrad Prix will be held the weekend of the 1st and 2nd of September and will include a support race by the American Lemans Series, which is by far the most exciting sportscar series in racing, putting 4 different classes on the track at the same time, ranging from the slower street going type cars, like the legendary Porsche 911, all the way up through the world beating corvetttes and, ferraris and Vipers and on to the most advanced prototype race cars in the world,such as the Audi R10s, driven by some of the best racers in the world and all racing on the same track at the same time Of course headlining the show will be the IRL ethanol burning Indy cars, driven by the same drivers that race in the INDY 500 SUPPORT THIS RACE I got the following information courtesy of www. grandprixcities. 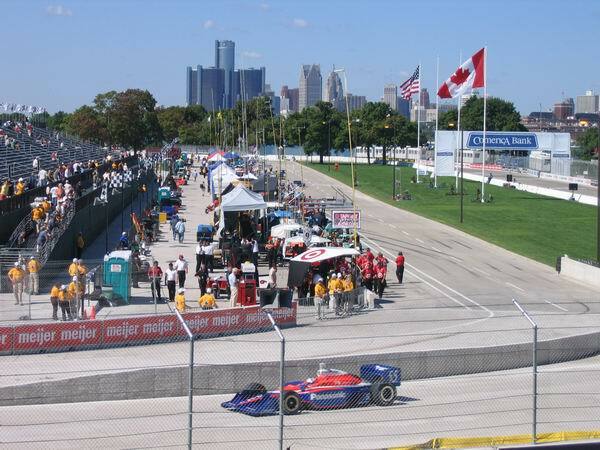 com September 2, 2007: MI Detroit Belle Isle IndyCar Series, Raceway at Belle Isle, Detroit MI - with 2007 ALMS Event . How cool that the Grand Prix is coming back. I like the fact that it will be IRL as they are running Ethanol, which is better for the environment than gasoline. I hope they make the track go counter clockwise this time as the other direction was not the best layout but gave a a nice camera shot of the dowtown skyline. Now if Detroit only had a great short track. anyway, THANKS ROGER!!!!!!!. (from- http://www. na-motorsports. com/Tracks/MI/Detroit. html) When Formula 1 arrived for the Detroit Grand Prix in 1982, the drivers were appalled. The track was narrow, bumpy and with no grip, the barriers were poorly positioned, escape roads too short, and tire barriers inadequate. The first practice session was delayed by almost 24 hours as emergency changes were made. After this fiasco, it is surprising that F1 ever returned, let alone for a further 6 years. Although things improved over these years, it was never a track that anyone could love and in 1988 Formula 1 departed. CART used the downtown circuit for 3 seasons before moving to the park course on Belle Isle. This was an attractive track, but inadequate facilities for modern racing (e. g. the paddock was on grass, which became a quagmire in the rain) led to their departure also.